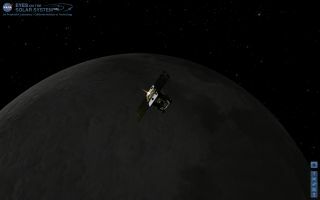 An artist's depiction of NASA's Grail-A spacecraft arriving in lunar orbit on Dec. 31, 2011. A NASA spacecraft is circling the moon, with another closing in today (Jan. 1) in back-to-back lunar arrivals to ring in the New Year at Earth's nearest neighbor. The two washing machine-sized spacecraft began their tag-team lunar arrival on Saturday afternoon (Dec. 31) with the New Year's Eve approach by one of the probes. If all goes well, the second probe will fire its rocket engine today at 5:05 p.m. EST (2205 GMT) in a 39-minute maneuver to enter lunar orbit. The twin Gravity Recovery And Interior Laboratory (Grail) spacecraft, known as Grail-A and Grail-B, are designed to map the lunar gravity field in unprecedented detail in order to glean clues about the moon's interior structure, composition and formation. The $496 million moon mission is expected to begin in earnest in March and last about 82 days. "My resolution for the new year is to unlock lunar mysteries and understand how the moon, Earth and other rocky planets evolved," said Grail principal investigator Maria Zuber, of the Massachusetts Institute of Technology in Cambridge, in a statement. "Now, with Grail-A successfully placed in orbit around the moon, we are one step closer to achieving that goal." Currently, the Grail-A probe is circling the moon in an 11 1/2-hour orbit that approaches within 56 miles (90 kilometers) of the lunar surface at its closest point and extends out to 5,167 miles (8,363 km) at the farthest point, NASA officials said. As of Saturday afternoon, the Grail-B spacecraft was about 30,018 miles (48,309 km) from the moon and closing at a rate of 896 mph (1,442 kph), according to a mission update. A team of 40 scientists will be watching over the probe's lunar orbital arrival to make sure everything goes as planned. "With Grail-A in lunar orbit we are halfway home," Grail project manager David Lehman, of NASA's Jet Propulsion Laboratory (JPL) in Pasadena, Calif., said in a statement Saturday. "Tomorrow may be New Year's everywhere else, but it's another work day around the moon and here at JPL for the Grail team." NASA launched the Grail spacecraft on Sept. 10 and the probes took a circuitous route to the moon, traveling nearly 2.5 million miles (4 million km) — about 30 times the actual Earth-moon distance. The meandering path allowed NASA to spend extra time testing the Grail probes' health, mission managers have said.